The Top Team has an important role to play in strategy formulation and organizational performance. How effective is your Top Management Team? How well prepared is it to deal with challenges of leadership, strategy development and organisational performance? Relationships – focusing on relationships with others in the organization. In analysing and evaluating the performance of the Team and its members these themes are analysed both in isolation to identify any potential weaknesses, and as a whole to ascertain the inter-relationships that make a successful Team. If it is not strong on each of these themes then its ability to identify and address challenges will be significantly diminished, to the detriment of the business. Members who are sensitive to the needs of the organization. Centredness - refers to how a person leads their daily life; ranging from those who do not need continuous interaction, living in their own inner world (introverted) to those who are more outgoing and needing to interact with a large number of people (extroverted). Behaviour orientation – refers to how individuals behave and whether their way of acting varies by circumstance or is consistent irrespective of the situation. Certain individuals can adopt a more directive approach, controlling others’ actions and ways of thinking, whilst others are more consultative, inviting participation and comment. Interfacing – examines how individuals relate, interact, cooperate across organizational and status boundaries. Certain people are more rational in their approach, paying attention to detail and focusing on getting the job done with minimal concern for how others feel, whilst others are more sensitivity oriented and are conscious others’ concerns and moods and focus more on building relationships. Cognition – refers to ways of knowing, forms of knowledge, or ways of instinctively seeing the surrounding world. Certain individuals are intuitive, grasp the bigger picture and use their creative imagination and insight when facing new and interesting challenges. On the other hand, the pragmatic individual thrives on detail, relying on experience and tangible information. 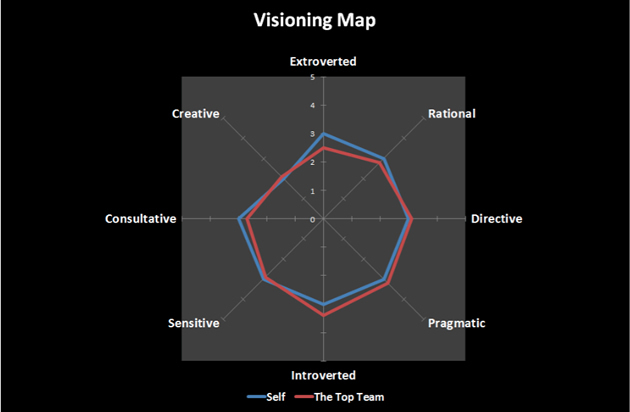 The example below shows that the Top Team member’s self-scores reflect that they have a similar profile to the Top Team as a whole, but tend to be more Introverted than Extroverted, indicating a desire for less interaction compared to the team as a whole. They pull in the same direction. Promote effective debate based on experiences/background. Working towards being aligned with others. Top Team and the Board. The tool gauges the issues that are of current concern to the Top Team and how effective it is at addressing such issues. If the team displays an inability to address such issues then it faces a series of potential opportunity costs for not addressing those issues, which will be to the detriment of the business. 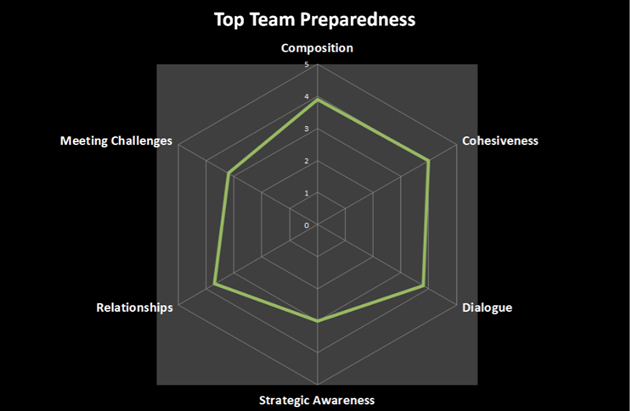 The example output below shows that the Top Team is well prepared with respect to its Composition, Dialogue and Relationships but would need to improve its ability with respect to Strategic Awareness, as well as addressing issues relating to leadership strategy and performance.